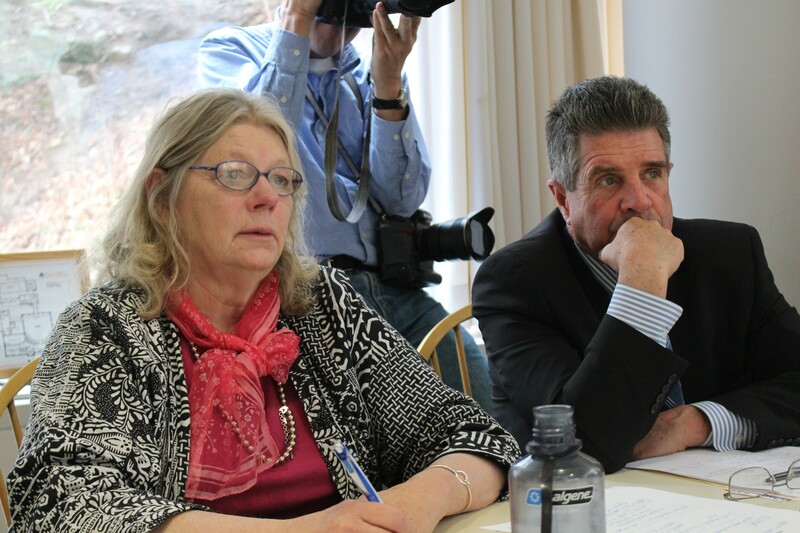 Sen. Jeanette White and Sen. Brian Collamore at a Senate Committee on Government Operations meeting Tuesday. The Senate Committee on Government Operations voted late Tuesday to establish an ethics panel to oversee the conduct of Vermont state senators. But after a story appeared in Seven Days Wednesday morning about the proposal — and an example of potentially unethical behavior — the committee's chair said she had changed her mind about creating such a panel. "We can't do it now because of you," Sen. Jeanette White (D-Windham) told the story's author on her way into a noon caucus meeting. "If we did it now, it would look like it was in reaction to your article, and it isn't." White said she still planned to turn her committee's proposal over to the Senate Rules Committee, which must approve it before it goes to the Senate floor. "I don't know that they'll even have time to do it this year," she said of the Rules Committee. The story in question outlined a series of events leading up to Senate President Pro Tem John Campbell's (D-Windsor) hiring last June as a part-time deputy state's attorney. Campbell lobbied for creation of the position at the behest of his future boss, Windsor County State's Attorney Michael Kainen. Both men say they never discussed the prospect of his hiring until shortly after the legislature adjourned. White said she was concerned it would appear as if her committee was establishing an ethics panel specifically to address Campbell's hiring. "I don't want it to look like we're responding — that we're setting this up because we think we need to respond to those charges," she said. "So if you write about it again, you have to say we're not doing it in reaction to that, because that's not what we're doing." An hour and a half later, White approached the reporter and said she had changed her mind again and would now support the panel's creation. "I'm going to turn our recommendation for a rules change for an ethics committee over to the Rules Committee now," she said. "I was just in a hurry and I shouldn't have said that ... So I apologize for that." White said she had just discussed the matter with Campbell, but that the Senate president had not provided her specific guidance about how to proceed. "I just wanted to make clear to him that we were not doing this in response to anything. We'd been talking about this before, and he said he understood that. That's what we talked about," White said. "He said, 'Do what you want to do.'" Campbell said Wednesday that he has "always" supported the creation of an ethics panel. "If it comes up, I would support it," he said. "If we have time to do it, I have no problem with it."